The Surface 3 is Microsoft's third attempt at the Surface (without the Pro) line and heralds a change in direction for the tablet that wants to be your laptop. The first two incarnations ran the now defunct Windows RT operating system while the new Surface runs the full, proper version of Windows 8.1. That means desktop apps like the Surface Pro line and it also means a free upgrade to Windows 10. 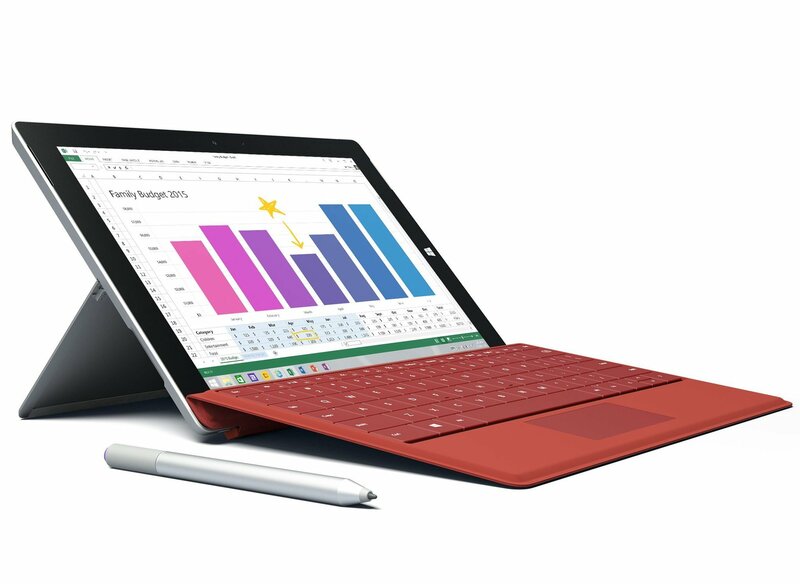 The Surface 3 bears striking resemblance to its bigger brother, the Surface Pro 3. Visually it follows the same design language and 3:2 form factor, but it's smaller at 10.8-inches compared to the 12.2-inches of the Surface Pro 3. It's also lower priced, starting at $499 and will be available with optional LTE data support. The reduction in price and size comes with a reduction in the internal hardware over its bigger brother. The display is a still excellent 1920x1280, and inside there is an Intel Atom CPU, 2 or 4GB of RAM and up to 128GB of internal storage. And as is traditional for the Surface line, there's an optional type cover keyboard and as with the Pro 3, support for a digital pen. It is also fanless system, with no vents. The Surface 3 is scheduled to go on sale early May 2015. Surface Go is Microsoft's latest budget bid with its Surface line, but how does it compare to the company's last entry, the Surface 3? Microsoft is pushing out a rare firmware update to its Surface 3 tablet, marking its first since late-2016. Microsoft is rumored to be bringing a new non-pro Surface tablet to the market later this year. If true, here's what we'd like to see in a new 10-inch Surface from Microsoft! The Surface 3 is still Microsoft's latest non-pro Surface 2-in-1. How is it holding up three years after it first released? Right now you can pick up a certified refurbished Surface 3 Tablet from Woot via Amazon for just $249.99, which is the best price we've seen on it yet. Woot is offering a pretty solid deal on the aging Surface 3 tablet, cutting its price in half down to $320. Is the Surface 3 still a good buy in 2017? We weigh the good and bad. If you're looking for a new bag for your Surface Pro 4 or Surface Book - even with the Performance Base - check out the 'classic' looking Outback Solo from WaterField Designs. We've just been made aware of an update that's currently rolling out to the Surface 3. According to Windows Update, we're looking at new firmware for August 8. You can now order those new Mozo Sneaker Sleeves to protect your two-in-one while looking hip. Microsoft has confirmed that the current inventory levels of the Surface 3 tablet are "now limited". It also stated that it will stop making the 10.8-inch tablet by the end of 2016. Should you be rocking the Surface Book, Surface Pro 4 or Surface 3 LTE Microsoft has an update for your Windows 10 PC. The Microsoft Store has cut the price of three of its Surface 3 tablets by $100, and today only you can also get a free docking station when you choose to buy one of those same models. If you are looking for a docking station for your Surface 3 tablet, you'll want to check out this deal from Best Buy. Right now, you can score one for just $80, a savings of $120 from its regular price. Microsoft is ending a Bing Rewards option that allows users to donate their points to their local school so they can get a Surface 3 tablet. The donation program will end on June 30. I already posted about some brief gaming I did on it but thought I'd make this for anyone that has questions or is still on the fence about it.